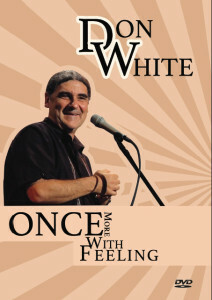 Equal parts comedian, storyteller and songwriter Mr. White’s performances have earned him a dedicated following for over twenty years. 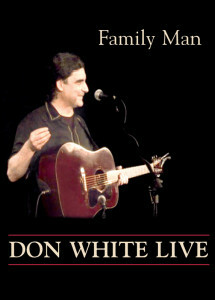 His third live DVD captures him at the top of his game in front of a sold out crowd. 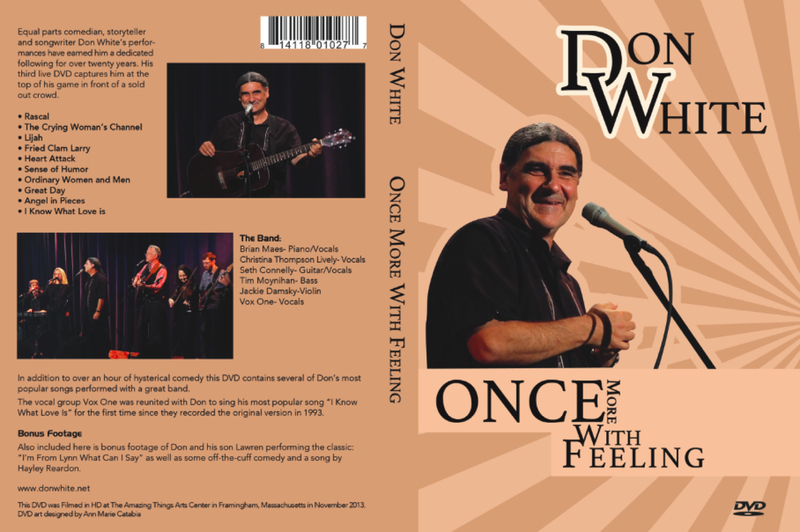 In addition to over an hour of hysterical comedy this DVD contains several of Don’s most popular songs performed with a great band of musicians assembled for the first time for this recording. The vocal group Vox One was reunited with Don to sing his most popular song “I Know What Love Is” for the first time since they recorded the original version in 1993. Also included here is bonus footage of Don and his son Lawren performing the classic: “I’m From Lynn What Can I Say” as well as some off-the-cuff comedy and a song by Hayley Reardon. This DVD was Filmed in HD at The Amazing Things Arts Center in Framingham, Massachusetts in November 2013. The video from these two sold out shows in June of 2006 at Jimmy Tingles Off Broadway Theatre sat around here for over a year before I looked at it. In the autumn of 2007 I finally got around to checking it out. In all honesty, I was hoping that it wouldn’t be that good so I could just throw it in a drawer and forget about it because I didn’t really have the money to make another DVD. Unfortunately for my pitiful bank account, I had completely forgotten what a magical weekend I had down there in Mr. Tingle’s basement in Davis Square. It was one of those weekends where you don’t realize how amazing it was until sixty more weekends go by without producing anything nearly as good. The audiences were awesome. There was palpable excitement in the room and it brought out the best in me. 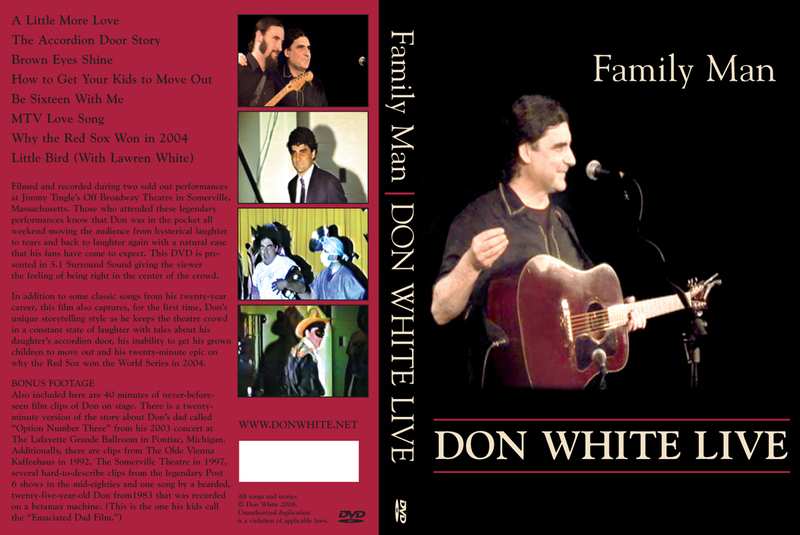 At the end of the video when I saw my son and I performing together as we had been doing for the previous thirteen years, I knew I had to hit a few scratch tickets and come up with the the money to produce this DVD. So I worked on it for the past nine months. I am very proud of the finished product. The camera work, the film quality and the video editing are fantastic. The audio is available here in 5.1 surround sound so when the audience is laughing ( which they do quite a lot) you feel like you are sitting directly in the center of the crowd. This DVD is 100 minutes long. There is a one hour section from the concerts in June of 2006 and there is 40 minutes worth of assorted bonus footage. I included all this old never-before-seen footage because I knew that my fans would have a twisted fascination with watching me get old and jowly over the course of 40 minutes. Here’s a break down of the bonus footage. 1) A twenty minute version of the story about my Dad, the Red Sox, knuckle balls and prostate problems called “Option Number Three” from the Live in Michigan CD release party at The Lafayette Grand Ballroom in Pontiac, Michigan in 2003. If you were there you know what an amazing night this was. 2) A song called “Fool’s Wind” that I had written when my son was born. This was recorded on a betamax machine in early 1983 in Lynn, Mass when I twenty-six years old, had a beard with no gray in it, still lived in Maine and weighed twenty five pounds. 3) Six short clips from the infamous Post Six shows in the mid-eighties featuring inexplicable on stage behavior. 4) An introduction to the song Charlie and Maureen from 1992 at the famed and fabled Olde Vienna Kaffeehaus in Westborough, Massachusetts while opening a ten PM show for the Pousette Dart Band. 5) An improvised piece on my father’s unique dialect from The Festival of Funny Songwriters at the Somerville Theatre in 97 or 98.This also includes a few shots of my son when he was sixteen. This is a very funny, extremely rare bit. Order you very own copy now by clicking here.